The battle between good and evil rages on! 7-inch tall action figures in DC's The New 52 style. 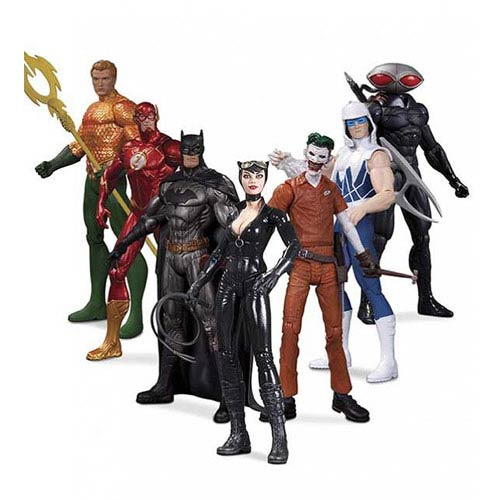 Pack includes Aquaman, Flash, Batman, Catwoman, Joker, Captain Cold, and Black Manta! The battle between good and evil rages on in the DC Comics New 52 Heroes vs. Villains Figure 7-Pack! In The New 52 style, each incredible figure in the group measures about 7-inches tall. In the outcome of good vs. bad, you end up the winner with this box set! Ages 14 and up. Aquaman features an updated head sculpt and scepter. The Flash and Batman both come in a metallic re-deco paint job. Selina Kyle, otherwise known as Catwoman, makes her debut in The New 52 styling, while the Joker and Captain Cold also feature updated outfits.